20-foot-long shark washed up on the Long Island shore on Tuesday morning, frightening local surfers. Just before 9am, surfers noticed a large figure circling in the water about 50 feet from Gilgo Beach and raised the alarm. The basking shark, which weighs an estimated 2,000 pounds, appeared to be in distress, according to witnesses. 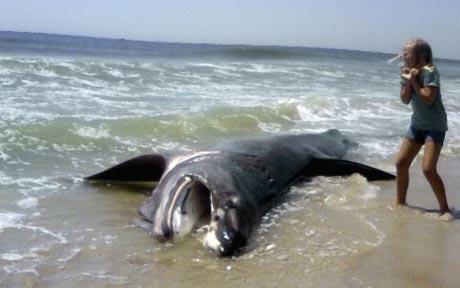 The animal circled for about an hour, and then washed up on the beach, just a few miles from the popular Jones Beach. George Gorman, a New York State Parks official, said researchers would examine the shark to determine a cause of death. After that, he said, the shark would be buried in nearby sand dunes. But while the impressive mass of the animal might have frightened the few dozen onlookers, it was later identified as a basking shark, which eats plankton, not humans. The basking shark is slow-moving, and is the second-largest shark, after the whale shark. That’s a bad a$$ fish. It’s a basking shark! Big? Yes. Dangerous? Only if you hit one of ‘em with your speedboat. If I were to hazard a guess based on that facial expression, I would say the shark watched Obama throw out the first pitch at the All Star Game tonight. If that fish is going to intimidate anyone, it’s going to need some dentures. It’s a toothless basking shark. It’s closer to an ant-eater than it is to a man-eater. I was surfing once at Coast Guard Beach on Cape Cod and noticed some seals playfully swimming under me. About 10 minutes later an approximately 20 foot dark shadow swam under me. I thought it was a White or a Tiger shark, but looking at the photo it may have been a Basking shark. A shark is a shark is a shark. I would have been scared sh**less if I were a surfer and saw this bad a** mammoth fish circling in the water. Signifigant protrusion of the snout in a basking shark. This photo clearly shows none. Humans commit suicide by jumping off bridges into water. Sharks and whales do the same by throwing themselves on land. Al Gore is going to blame Global Warming. Good heavens! I’ve been to Gilgo Beach, and FRiends, let me tell you...I’ve never quite gotten over the whole “Jaws” experience. I’d have had an embarassing accident if I’d seen this thing coming at me while I was swimming in the ocean. I guess it wasn’t the dreaded Landshark. Looks more like a Mud Sh- Sh- Shark.